Let’s face it: Soap making is a finicky craft. It takes time to find a recipe and method that gives consistently good results. Even then, you just have to add one new ingredient (e.g. honey) and – boom – soap volcano. If you manage to dodge all major soap catastrophes and get to the point where you want to try your hand at an intricate design, it’s the small details that can really make a difference. 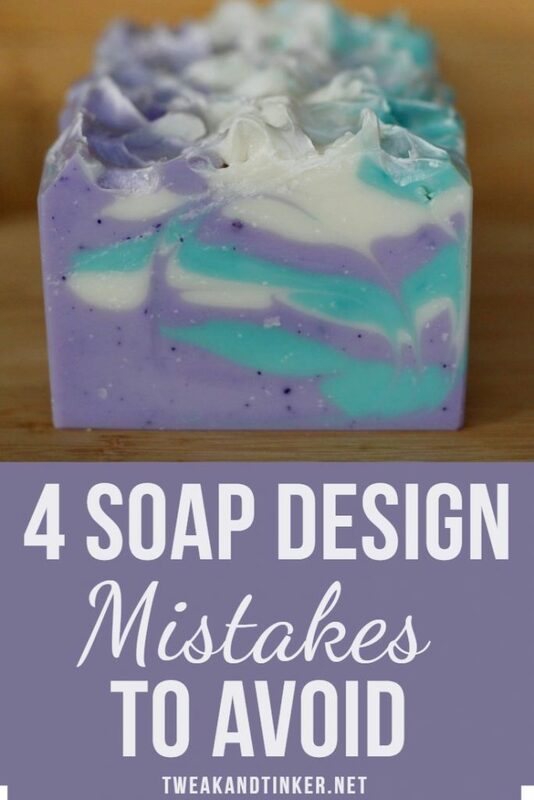 Over the years I’ve had many soapy fails, some turned into flat out unusable soap, but some just didn’t quite hit the design mark (the one that I had set for myself). 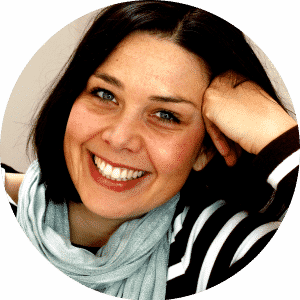 I want to share 4 things I’ve discovered along the way that have impacted my soap design (and not for the better). Oftentimes when we want to achieve a certain design we need to separate our batter into separate containers in order to add different colors to it. Now, in the past I’ve often used let’s say 2 plastic jugs and a glass measuring cup. I always wondered why the batter in the glass container was so much thicker? Until one day it dawned on me: the glass is keeping the batter warmer therefore trace was moving faster. Aha! And how did this hurt my design? Well, I was attempting a hanger swirl sort of a thing and the thicker batter moved differently than the other two. The problem wasn’t necessarily that it was thick, it was that ideally you want all three colors to have uniform consistency in order to get a harmonious swirl. 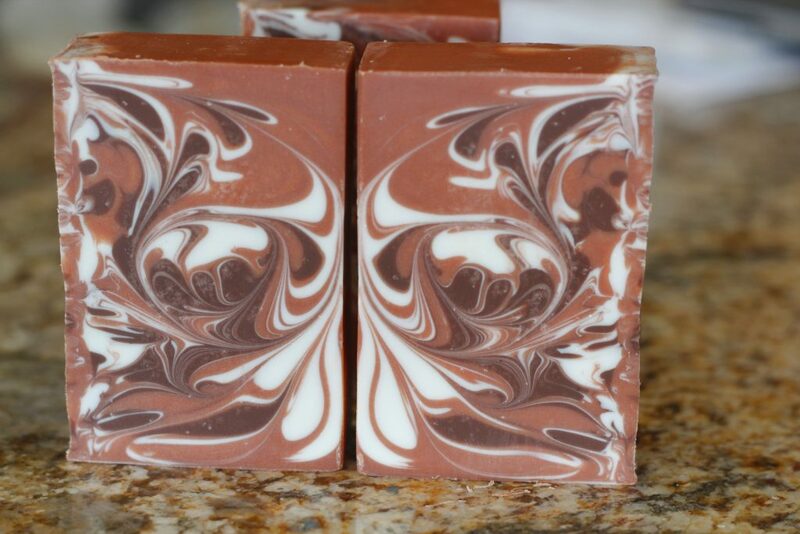 So, yes, it did make the swirl look less fluid, but on the whole the soap still looked fine. I’m not one to make extra batter to have just in case. Whatever amount my mold holds that’s how much I make. But that also means that I need to, depending on the look I’m going for, be bold and dump most of my batter in there if I want to fill my mold all the way. I’m always surprised at how little I really need to deck out the top. I just need to thoroughly scrape my bowl and, voila, just enough. But I find myself too often with way too much batter at the end and I wind up dripping more and more batter on the top. Look at this butterfly swirl I made a couple of years ago. Can you see how on the side (which really is the top, I just flipped the soap for the photo) things get a little busy and stop being part of the more fluid swirl? I think it would look much neater without the drippy bits on top, don’t you think? Speaking of soap tops, here’s another one. I tend to sometimes get so caught up in the swirling and whirling action that I don’t realize that my colors have long all mixed together and are now one indistinct muddle (is that a word?). Just like when my kids experiment with mixing different colors, well eventually it always ends up being – brown. The key is not to overdo it, when you think it’s good enough leave it. This used to happen to me a lot and I used to get so mad. The main reason probably was that I was using oxides and underestimated just how much you have to premix them in order to get a good result. In the image below I realized when I was in the middle of making the soap that I hadn’t premixed enough color so I just dumped teaspoons of oxides straight into the batter. As you can see the stick blending didn’t help. Just save yourself the trouble and use micas they’re far easier to incorporate. I always keep a premixed condiment bottle of titianium dioxide handy and always strain it before it goes into the soap. 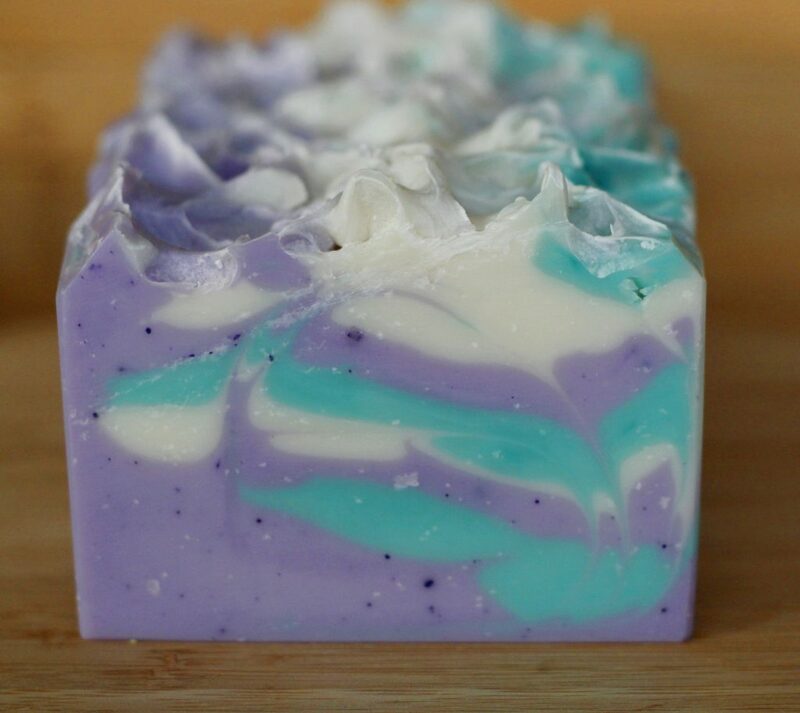 Are there any “mistakes” you’ve made in the past that have affected the look of your soap? Maybe something that you’ve discovered by chance? I’d be curious to know. I wanted to use cranberry juice and it turned the ugliest “I have a really bad stomach” green when mixed with lye! I didn’t know about the glass jar vs. plastic jars. Now it all makes sense!!! Thanks for sharing!